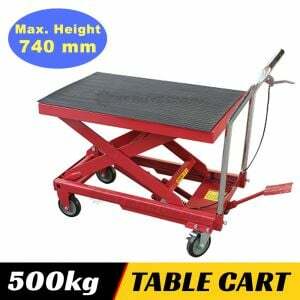 Product Details : The Motorcycle Scissor Lift Jack VP8218A is a great lightweight unit for lifting motorcycles. It has been designed for super strength and durability for lifting the touring motorcyles or quad bikes or even cruisers. 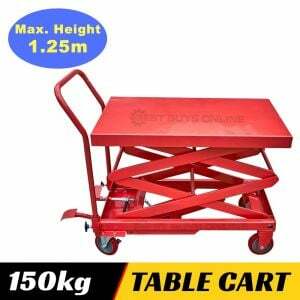 Constructed from heavy-duty steel with a large 500kg capacity and equipped with socket-driven scissor lift frame, it offers maximum stability and strength. It features a wide base (23.5mm) with 3"" wings on each side for extra stability. It comes with simple crank operated manually and adjustable saddles that suit any bike frame, providing an easy and efficicent support. 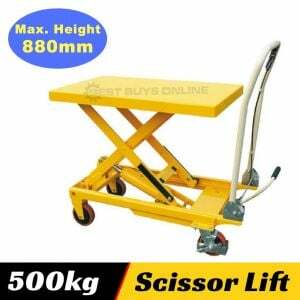 It has a work bench height that is adjustable from 90mm to 405mm, allowing it to lift motorcycles or bikes with ease and making it ideal for bike maintenance. You'll also be pleased to know that it has a compact design that can winds down when not in use for easy-to-organise storage and portable.